Apostolic Titbits: Easy To Forgive? Forgiveness is the is the biggest spiritual test for a Christian, it is impossible to forgive anyone without a good reason to do it. But the one ultimate reason God has given to all of is to look to Him as the source and inspiration to forgive others. Remember, even when we were enemies of God in sin while we believed Jesus as our Lord and Savior, He chose to forgive all our sins unconditionally knowing fully well that we will again sin because of our indwelling sin nature which influences us to sin many times even after we are born again till we die physically. It is easy to forgive others when we see God as our reason to forgive all our offenders. 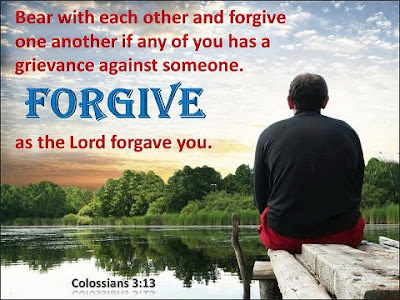 When we know fully well that people offend us and betray us because all humans have this innate sin nature which influences them like we are, it is easy to compassionately forgive others like God forgives us. So the next time you feel that it is hard to forgive someone, just remember we are not forgiving people by our own strength but by the strength of God who has forgiven us unconditionally and has set an example for us to follow. We forgive others because God has forgiven us our past, present and future sins all at once in Jesus Christ and continues to forgive our sins presently whenever we come to Him confessing our sins, which when left with out confession to God, separates us from the consciousness of His Presence. We cannot forgive others until we throw away our wrong thinking that makes us think that we are actually forgiving others by our own strength. Only those who think humbly to acknowledge to God that they cannot forgive others without His forgiving-grace can only forgive others with joy in their heart and progressively learn to live a abundant life of heaven on earth. IT IS EASY TO FORGIVE WHEN WE KNOW THAT WE MAKES MISTAKES AND ARE FORGIVEN BY GOD EACH TIME. FORGIVE NOT FOR WHO YOU ARE AND NOT EVEN FOR THE REPUTATION OF THE OFFENDER, BUT ONLY FOR-GIVE OTHERS BECAUSE GOD HAS FOR-GIVEN YOU AND CONTINUES TO FORGIVE YOU EACH DAY UNCONDITIONALLY! When God is the reason and strength for you to forgive others, it is very easy to forgive others no matter what.